Alice Hewson from Berkhamsted, Herts, a student at Clemson Universty, produced arguably her best performance in three years on the USA women's college golf circuit with a brilliant victory today in the Clemson Invitational tournament at The Reserve @ Lake Keowee, Sunset in the state of South Carolina. Starting the final round of the 54-hole tournament in ninth place, she came storming through for a one-stroke victory on the back of a bogey-free, five-birdie round of 67 for a total of 10 under par 206. Alice's earlier rounds were 70 and 69 over a par-72 course of 6,260yd. 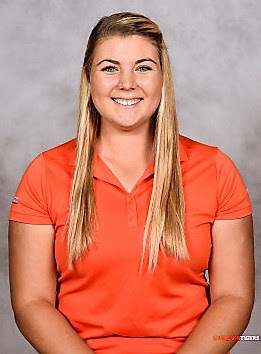 The GB and I Curtis Cup player - who will be a vital player with her experience of American conditions when the 2018 match against the United States is played at Quaker Ridge Golf Club, New York State in June - had a bag of 14 birdies and four bogeys over the three rounds. Unfortunately, Alice lacked the close support from her team-mates for Clemson to pull off a double whammy and win the team title. Sydney Legacy, who finished T4, was the only other Clemson player to make the final top 20. Clemson finished third with a total of 846, behind title winners Furman (834) and Michigan State (844).